Well, well, well…it is that time of the year again! The day we celebrate women! Strong, powerful, small, big, short, tall, women of all races and places from all around the globe! Happy 8th of March, the day that we have been celebrating as the International Women's Day since 1908. 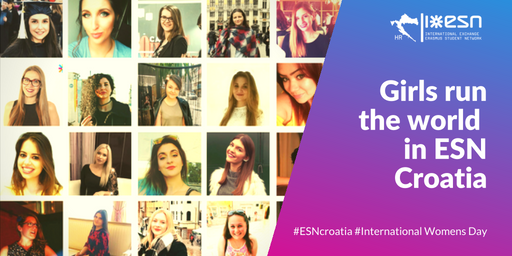 We all know about different facts stating that women are underrated, not paid enough…and don’t get us wrong, they are and these issues should be highlighted, however, we would like to share how the scale is tipped in ESN Croatia and its local sections! And let’s not forget our National Board and Board Support. Out of 6 members of NB – 5 are women, and yes, you guessed correctly, the national president is also a woman. And the last, but not the least, in our national Board Support we have 3 amazing women doing a great job. So, to round it all up, thanks to all this amazing, smart, bright and creative leadership, ESN Croatia is doing better every single day and continues to provide an amazing Erasmus experience to incoming students!